As detailed last week, reviewing hundreds of science-based projects on the most popular crowdfunding has taught me a lot about how citizen science is viewed by the public. I've also gained some insights into what makes a successful crowdfunding campaign and an unsuccessful one. More on that in two weeks. But it's also given me a lot of insight into the different types of citizen science as viewed from outside our field, and outside academia. 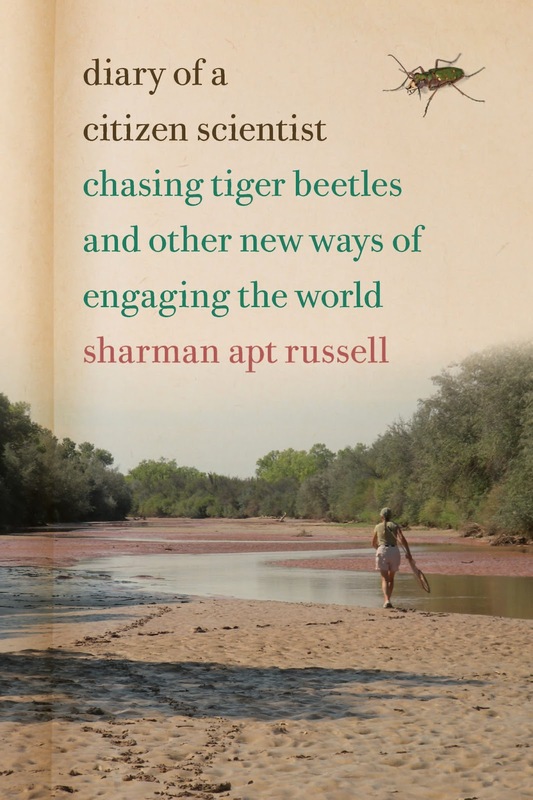 Perfect for better understanding the business of citizen science and how citizen scientists can take advantage of it. The first of these is an increased appreciation for the role of curiosity in citizen science projects. This has led me to begin considering a new model for classifying citizen science projects that shows some promise for better understanding people's interest in citizen science and identifying new opportunities for expanding the field. Applying it to our crowdfunding research and comparing the results with results from some other models we've used may provide a lot of insight. But before going further a little background might be useful. Some of the most important insights came from the various emails and comments I received to those posts. One person in particular asked about the uBiome project that was funded through IndieGoGo back in early 2013. This was quite a success story. While only requesting $100,000 they quickly doubled it and have since earned (since the campaign is still open) over $300,000. 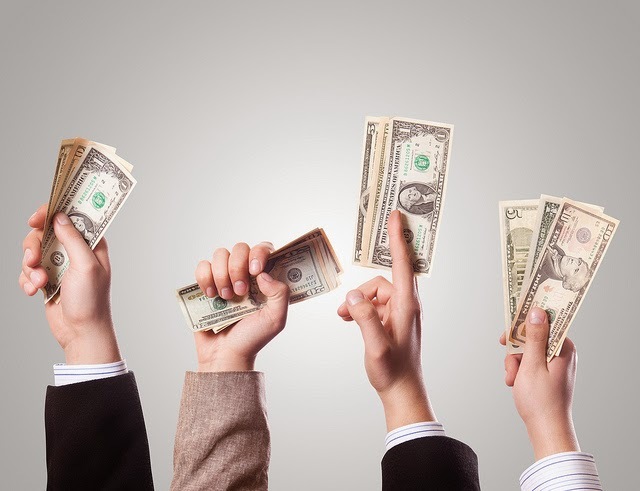 All in addition to money they earn from sales directly from their web site. This is a very exciting science project that has developed kits for genetically identifying the bacteria growing in each person's gut; these are sold to the public that send in their samples and receive back results on bacteria in their own bodies. So uBiome was not just funded by the public, but it's main sales audience is the general public and their research data is derived from the public participants. It's a very good science project. But is it a citizen science project? On the one hand the Indiegogo description itself talks a lot about citizen science and using the data as part of a large citizen science project. In fact this brought it to my attention from the very beginning. It is also highly dependent on public participation as the primary data source that fuels their scientific research, and then returns that analyzed data back to the user. So in some ways a user is running a scientific test on their own bodies and getting results. After aggregating all these results uBiome will be mining the data for important and novel research on the role of gut bacteria on human health. All of these make this look like a citizen science project at first glance, and I even included similar types of projects (Genographic Project and Wisdom Panel) which do similar things with human and pet ancestry. On the other hand, when looking closely at the citizen science definitions I initially couldn't fit this in. It was not organized or designed by a private citizen...it is run by a for-profit company managed by Ph.D. Scientists. It does not involve citizens in the hypothesis creation or sample analysis. Even the larger data analysis is not available to public participants. They just receive their own results. Once received, this information does not have any practical utility or potential impact on the citizen scientist. They can't (yet) use if to make medical decisions like a genetic test would, or learn about their ancestry; it's main use instead is satisfying intellectual and personal curiosity. The closest they can come is ordering multiple kits and tracking changes over time (or as variables like diet change) That's not a bad thing, but again it does not support the "citizen science" label. The final argument is that by signing up and sending in their samples, the public is acting as a data collecting "contributor" in much the same way they would send in bird sightings or amateur sky observations. This is one of the primary ways citizen scientists get their start and is the base of my levels of citizen science involvement model. And it's not just a passive involvement; in many cases participants can be very passionate about those projects and devote significant time and money to the project. There's a great example in this week's most recent issue of Science magazine, where the author (who has written often about citizen science projects in the past) get's involved for the first time with a genetic testing project. But it's not just for curiosity' among the many genes she is having tested include many cancer indicators that may potentially run in her family. So she can use that data to influence her own medical choices and inform the rest of her family who may also share those genes. 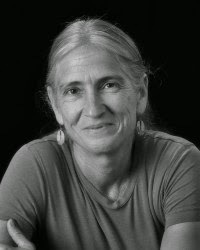 Citizen science is not just a passing fancy for her; it could save her life. So this level of involvement remains an important way to participate. There is one other important side issue here. If a person's sole contribution to a project is as a human subject, is it still citizen science. I personally would argue "No", but for variety of ethical reasons (including some with my current employer), I can't fully go into it. But it would be a great topic for further discussion. Ultimately they are about satisfying a personal curiosity but not in breaking new research ground. And that's not a bad thing. So I'm adding uBiome back to my Citizen Science Crowdfunding list and re-evaluating some others I'd previously not included. So thank you all who brought these issues to my attention. Pure Research for Scientific Advancement: Addresses an issue of theoretical, academic, or general scientific interest. Applied Research and Analysis: Uses scientific research techniques to address a specific real-world problem. Curiosity Research: Uses scientific research techniques to answer an unknown question with little direct practical impact. On the citizen scientist? Scientific Activities: These do not generate any new information and the results do not have any direct application; instead the activity has educational or non-practical goals. It's important to note that these classifications by no means indicates "better" or "worse", or that one is more "worthy" than another. Instead I think it's useful in helping people expand their definitions by providing a structure to view these alternative models with. I also think we can build this out and find some intriguing insights on things that work best in one model but less well in others. So it should have a practical purpose. And hey, creating models is academically interesting too. 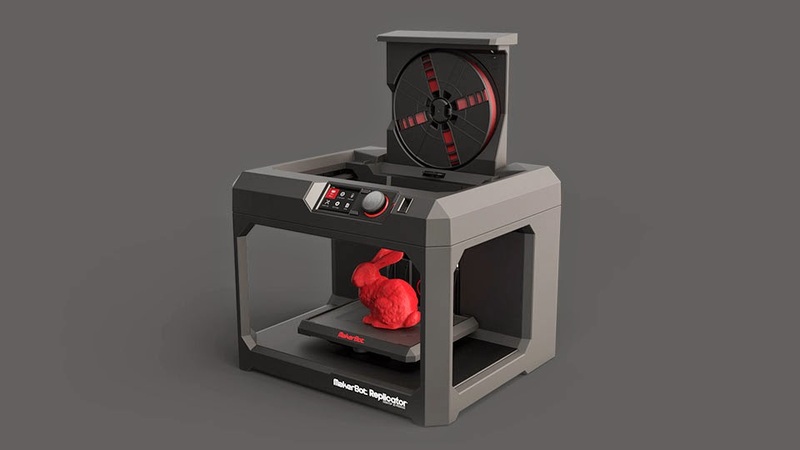 Will this model be useful? Am I making distinctions that don't exist? Are my definitions to narrow or are my biases showing? Let's test the model and find out. I'll start working on that now and present the results in a future post. But if you have your own thoughts let me know in the comments below. The last few weeks I've been fleshing out thoughts on citizen science business models in preparation for next year's Citizen Science Conference in San Jose. There is so much to sift through and people to talk with that I wanted to hit the ground running. Of course there won't be nearly enough time to discuss everything during a two-day conference, but I hope this will start a discussion there, and on this blog, for a long time afterwards. One interesting book I came across was "Making Open Innovation Work" by Stefan Lindegard, which offers great insights on companies harnessing the innovation of external researchers. Many of these lessons can be applies to our discussion, but that's not why I'm writing. Instead it forces me to ask a question that has bothered me a for a while but I've never successfully answered. 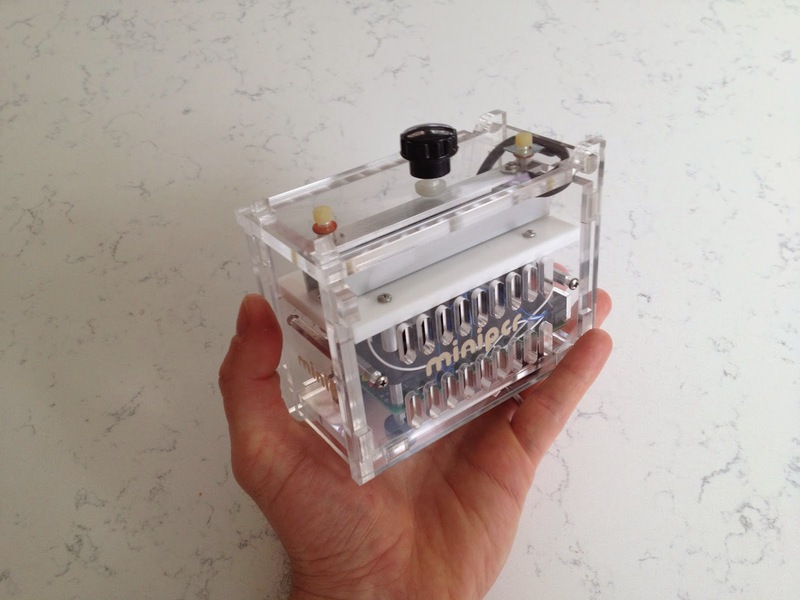 What is the dividing line between citizen science and open-source computing? Is there one? The reason I ask is the book discusses the work of TopCoder.com, a web site that connects open-source computer programmers with companies looking to pay for code. Think of this as a for-profit version of the site Github.com. In many ways what they do is scientific and many of the same citizen scientists in our field are the same as people drawn to open-source computing. But the two fields have never really connected and we don't often hear them talked about in the same context. Is this just a remnant of people not understanding the fields of data science/computer science, or is there something deeper? I have ideas on some of the differences but I want to hear yours. Let me know your thoughts in the comments below. I'll keep answering this question online before the conference and keep this conversation going. But I think it's an interesting discussion regardless of a future presentation. Care to Team Up on Some Citizen Science Conference Sessions? I love a good conference. Most are filled with opportunities to learn new things and meet like-minded people. You can become an expert in anything by yourself at home, then suddenly realize there is much more to learn. And it's a great way to stay motivated until the NEXT conference. Which is why I'm so excited about next year's Citizen Science Association Conference in San Jose. But what do I plan to talk about at the meeting? And do you want to join me? For starters, there is an open Call for Proposals for sessions due mid-September. As I wrote last week there are some good ideas I've been considering that would be of interest to attendees and would take advantage of my previous work. I've since narrowed it down to these two. If you would like to help with them or have ideas of your own to add, please let me know. I'd love to make these as inclusive as possible with the participation of a wide variety of people. In other words, doing it the citizen science way. For Love and Money: Business models for creating a citizen science industry infrastructure that supports, and benefits from, the work of citizen scientists. An important finding of my poster for the 2012 Citizen Science Conference was that "... the strongest positive correlation for all interactive citizen science projects is the availability of a reward." This piqued many people's curiosity and was the source of many discussions at my poster. While they all agreed with the sentiment none had a really good (and cost-effective) way of doing that, and they were looking for advice. Unfortunately this is a "chicken and egg" problem where you need scale to drive benefits that bring monetary rewards, but getting to that scale required monetary incentives. So we need to break this logjam and incrementally create a self-sustaining infrastructure that will support our efforts. This fits under the theme of "Tackling grand challenges and everyday problems with citizen science" by addressing the only way to ensure extensive data collection and public participation in scientific research - by introducing a profit motive. This half hour session will include independent research on existing techniques, analogies to other scientific fields, select experiences from current companies in the field, and impact analysis of existing projects that include profit motivators. The big challenge here is providing organization and self-sustaining momentum to the citizen science movement. Currently we are reliant on people's good will and free time for their participation. This applies across all of the various scientific fields that citizen science impacts, such as medicine, ecology, astronomy, and climate change. While this has worked for the time being we need to find ways to bring the POTENTIAL for amateur scientists to earn money from their work. To do that, companies need to be able to profit from the work of amateur scientists. Through this session, we will see how developing an mutually beneficial infrastructure can help all participants and will lay out a course for achieving that vision. The big question is how large and long this talk will be. There is a short version I can do as a solo speaker that should engage the audience and provide a lot of new perspectives to spark discussion. And I'm already planning to include insights from some people already trying to make this work. But I am still looking for some people/companies with experience partnering with and profiting from citizen science efforts. If you are one of these people and would like to join the discussion, I'd love to make this a larger panel discussion for the full conference. This fits under the theme of "Digital Opportunities and Challenges in Citizen Science" by evaluating the impact of various "Open Science" efforts begun by Federal agencies on citizen scientists and citizen science projects (ironically, that is a different meaning than in my "OpenScientist" name). This would be a short, 15-minute talk about the current policies of various Federal research agencies, description of the data and materials available to the public, analysis of how (and if) it is actually being used by citizen scientists in their research, and ideas for expanding both its use and utility. Unfortunately this is actually part of my day job and may require some ethics approvals to present. But if there are people who want to talk about this issue (from either a citizen science or Federal agency standpoint) please let me know and it will be worth my going through clearances. Unfortunately not all of my ideas fit into the six conference themes. So "Citizen Science vs. Citizen Pseudo-Science: Separating amateur researchers from public crackpots" will need to be a future set of posts on this blog, as will "Federal Government's Role in Supporting Citizen Science: A history and future opportunities". A third is a prime opportunity for a much longer set of posts or even a separate web site:"Re-Examining Citizen Science Throughout History: How pervasive were amateur researchers in the history of science versus "Establishment" or "Professional" researchers. How can we apply those modern terms to yesterday's society? Can we use historical lessons to increase public participation and respect in the field?" It's not something I can show publicly in the next few months since time will be limited, but I encourage anyone interested in this topic to get in touch with me at OpenScientst (at) gmail.com. I have a lot of ideas and would love to hear yours too. This blog was started to highlight the many citizen science projects available and show people how easy it is to contribute. I've come a long way since then and have begun focusing on larger citizen science themes as well. But I still like to showcase new projects every now and then. Especially one so close to my heart. 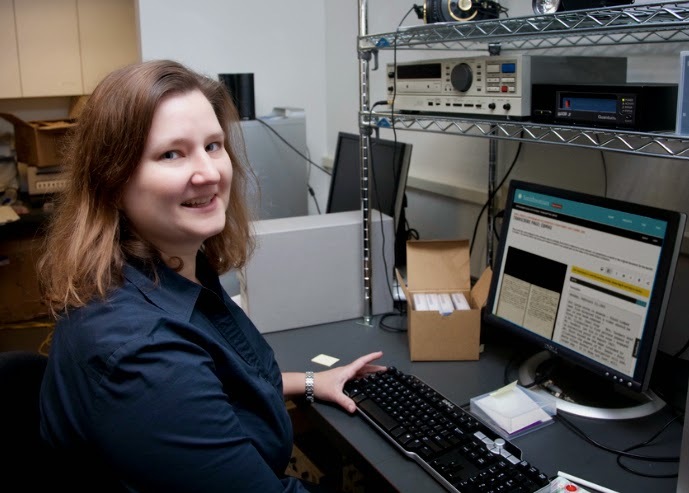 The Smithsonian Digital Volunteers program needs your help going through their vast collection of historic scientific archives and transcribing the data for future analysis. With a collection as large as the Smithsonian's a huge number of pieces are donated or created by institution scientists, but their data can easily be overlooked or lost among the overwhelming volume. By digitizing and transcribing, all the information can be cataloged, stored centrally and then reviewed by anyone interested in the topic. It also allows researchers to use modern data management and analysis tools to find previously hidden connections from within the various sources. This type of data has many different uses. In some cases, historical weather data, and even counts of plants and animals, can be used to track climate change and global warming. Even the impact of that change of local species can be tracked with that data. It also allows information on now-extinct species that were alive back when the record was created, and allows scientists fill in the holes in the historic record to see how our wold overall is changing. Transcription may sound easy but things can get complicated. And not just because of handwriting that is worse then mine. For example, take the snippet below from a mid-1800s electrical conduction experiment performed by former Smithsonian Secretary Joseph Henry. There is a word here (highlighted in yellow) which seems to be six letters long and is some sort of synonym for "travel". Also, based on a review of other letters on this page, it is most likely an "H" since the one other word starting with an "H" looks nearly identical to it. But the word eludes me and has eluded the six other people who have worked on it so far. You may have better luck, but it's this type of roadblock that can suddenly eat up your transcription time, and which the Smithsonian can not afford to have their own staff doing. A further analysis of electrical terms beginning with an "H" may help provide the answer, but so far it's still being worked on. This is where you come in. Register for a new account by visiting the New User Account page and supplying a username and email address. Once entered, check your email and click the verification link to confirm your intent to create the account and set up a password. No other personal information is required. Visit the main Transcription Center web site to learn more about the project and discover the source transcription materials that most interest you. Review the Instructions for transcribing. In a nutshell, include every word as it appears in the document (misspellings included) and accurately describe any images on the page. Don't worry about bold or italicized text but do note any underlines or strikeouts. Go back to the main page and pick the source material you wish to work from. Click on it, and then see all of the pages in that document. For starters, pick one that has not been begun. 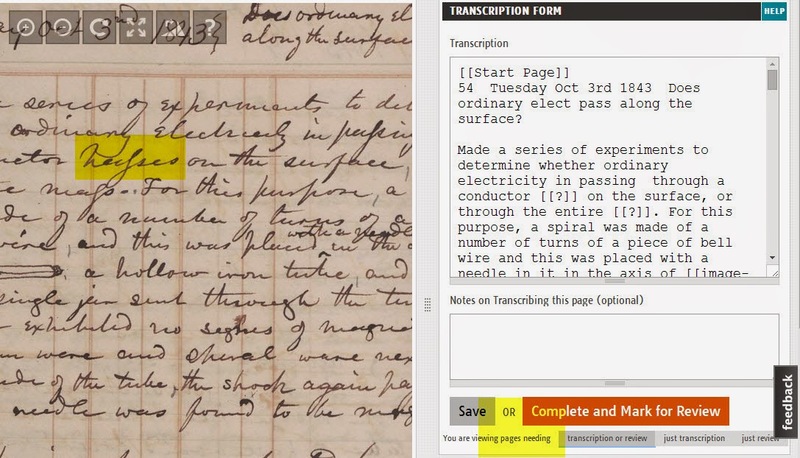 Transcribe the page as directed in the instructions. Once you are fully done, click to Submit for Review. If you wish to review someone's transcription, click a page marked "Needs Review" and proofread the entire page. If there is not a single error, click "Mark as Complete". This sends it to Smithsonian staff for finalizing. If there is a problem, make the change and then click "Complete and Mark for Review" to have another independent person review this updated, corrected version. If you are unsure of a word, just enter a set of double brackets [] and add your best guess. This will help the next person while not making it an official note. It really is simple to lend a hand. Just select from the source materials currently available; right now they are categorized into themes of "Biodiverse Planet", "Mysteries of the Universe", "Field Book Registry", "American Experience", "Civil War", and "World Cultures". These aren't just pulled from the scientific artifacts but the entire Smithsonian collection. So not only can you learn about science, but U.S. history and art as well. 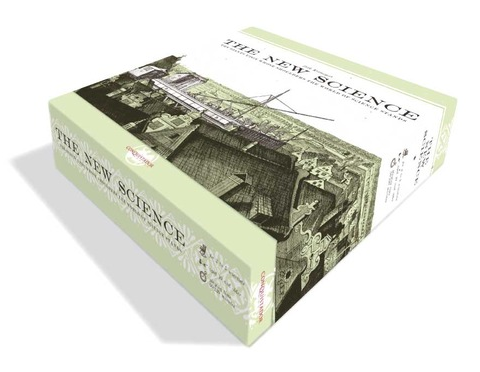 This is a great project for new citizen scientists, people living in the Washington, DC area, environmentalists studying climate change, and anyone interested in the history of science. So what are you waiting for? Let's start transcribing! Can we Talk About the 2015 Citizen Science Association Conference? 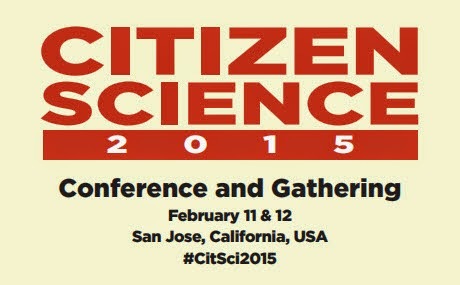 Next February 11-12, 2015, the Citizen Science Association will host it's first conference in San Jose, California. Will you be there? Two years ago citizen science practitioners and participants gathered in Portland, Oregon to discuss the present and future state of Public Participation in Scientific Research. Yours truly was there as were many of the most active players in our field. Everyone learned a lot, shared their experiences, and started planning how to move the field forward. Out of that an association was formed and now a conference is being planned. So jump on board and join us in planning the next steps in our evolution. It just get's bigger and better. Register for the American Association for the Advancement of Science (AAAS) meeting that this is technically a part of. Attend the whole AAAS conference or opt for a $23 reduced fee registration of just the Citizen Science Conference. Make preliminary travel plans to San Jose that week and reserve a hotel room before they sell out. Don't contact the hotels directly but instead work through the AAAS meeting coordinators. Check back with the Citizen Science Association before November 10 when the Early Bird Registration Discount ends. One more thing. Have you thought about what you want to say? The Citizen Science Association has placed a Call for Proposals (workshops, short talks, panel discussions, poster sessions) due by September 15, 2014. Personally I am contemplating a few different ideas and am trying to narrow them down. Some material will come from things I've discussed in this blog, while others may be from other experiences and new research I've been working on. But if you have some interest in these topics or might like to join forces, just let me know at OpenScientist (at) Gmail.com. I think some of you are working on similar ideas and I'd love to hear your thoughts. Re-Examining Citizen Science Throughout History: How pervasive were amateur researchers in the history of science versus "Establishment" or "Professional" researchers. How can we apply those modern terms to yesterday's society? Can we use historical lessons to increase public participation and respect in the field? Much of this blog has been about large, national and international scope citizen science projects. But that only scratches the surface of what's available. In fact the large number of citizen science projects happen at the local level...at state parks, community colleges, and local high schools. So we can't ignore all those great opportunities. But what happens if you don't live somewhere with a lot of citizen science projects? Are there places you can move to and get more involved? Let's find out. Access to Universities and Community Colleges: There is nothing like a nearby institution of higher learning to cultivate to inspire a passion for research. Many universities are built around research and have a world of resources available for everyday people if you ask nicely enough. But even if their tools are locked up tight, the opportunity to learn about advanced topics through seminars and open campus days often available, and many professors plain love to talk to local residents about their labs. It's their favorite subject! And those professors are often the same ones who indulge their science passions further as citizen scientists in fields outside their day-to-day interests. But most importantly, these research professors are the ones designing and managing citizen science projects for people in the community to join. Proximity to Museums and Science Centers: There is no better place to inspire everyday people to science like a local science museum. They explain complicated topics in ways that everyday people can understand, and help relate it to their lives. They also run programs that involve the local community, many of which are citizen science projects. So finding a good science museum is another ticket to finding well-run projects. Access to National, State, and Local Parks: What better place is there to see hundreds of unique plants and animals than in the national parks set up to protect them? Not only that, many of these parks are in places with significant geologic figures, or even scientific bounty (such as Dinosaur National Monument in Colorado and Utah). And, as we've seen at universities and museums, there are many great local citizen science programs eager for volunteers. 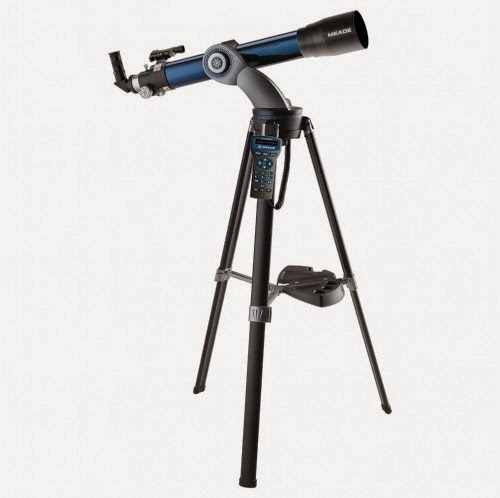 Dark Skies: For astronomy lovers nothing beats a deep, dark sky field for excellent star-gazing. Whether it is a meteor shower, approaching comet, or bright planet everything is crisper on a clear night. Experts typically recommend getting out at least an hour for major metropolitan areas to get the best views so rural areas typically get the best views. But you'll know you're in a good spot once the Milky Way's dusty veil is clear even with a moon in the sky. Environmental Consciousness: Many of the most active citizen science projects are performed by people protecting natural resources. In fact much of the field actually grew up from this community, where local citizen would test local waterways for contaminants or count the wildlife due to pollution concerns. So an area with a high "green" contingent where the public is highly sensitive to environmental concerns will also be a great place to find interesting citizen science projects. But these are just a few thoughts to get things rolling. Are there other factors you can think when identifying areas supportive of citizen science? Let me know in the comments below and I'll be happy to include them. But where in the US are these places? Tune in to next weeks post for a few answers. (Updated 8/10/2014 to add Entrepreneurship as a sixth trait). Who knew my citizen science skills would come in handy so soon after childbirth? Becoming a new father has been challenge for me as it is for everyone. There is so much to learn about caring for a child, caring for the new mother, and helping your child not just live, but thrive. Add to that all the personal baggage, as well as societal and psychological expectations, that are brought into parenting, and it can be overwhelming. Fortunately our pediatrician's office has been a great source of information. The doctor's and nurses pull from the latest medical research and their own experience to guide us on our way. But as much as science knows about child development, it becomes quickly clear how much is not known. Even for one of the babies most basic needs...food. Every one of the 4 million families with newborns must deal with is how to handle bottle feeding (either breast milk or formula). Both are very valuable commodities that you don't want to waste, so the simple question arises of how long a bottle lasts either with or without refrigeration. With nearly every one of the using bottles of some sort you'd think there would be simple answers. But there aren't. So that's where my citizen science background comes in. In a perfect world my doctors, the American Academy of Pediatrics bible "Your Baby's First Year", or any other authoritative source would have answered this question. But they don't. So we turn to one of the most trusted yet often least reliable sources...the Internet. Which is where I found some of the best information from a blogger who is also a true citizen scientist, whether she knows it or not. In her post ""The 2 Hour Rule: Is a Bottle Safe When it's been Left Out too Long?" this question is addressed head on. First she checks with the most authoritative source she can find, the Infant Formula Council. They should have the most expertise on the subject and access to a wide variety of research. The main problem is the potential for bias as a manufacturer's trade group. So she balances that recommendation with one from the non-biased American Academy of Pediatrics. Not only will they give a new perspective, but they represent the collective wisdom and expertise of doctors. Also, between these two, she has looked to the "Experts" for advice and is willing to accept it at face value. However, while both discuss the topic in generalities neither provides a concrete answer. So she must continue looking. The next step is to review the literature. This is tough to do as an amateur but not impossible. It just takes some persistence with Google or other search engine and then hoping the articles are publicly available (much more on this in a future blog post). But it is not a blind search...it is informed by the dangers described by the "Experts" above. She is not dismissing their concerns, but trusting them and using them as a source for further exploration. Finally, when all is said and done, she finds a related study on the impacts of time on formula feeding. It's not completely on topic and does not directly answer her question. And it was paid for by a bottle manufacturer. All issues which she notes in the article. But she does present it to inform her final decision. Sorry, I'm not going to reveal that. You can find the answer yourself here. The point is not whether formula can be used after two hours, or the relative merits versus breast milk. It's to demonstrate some key points I've been trying to make ever since starting this blog. Just because you are not a Ph.D. scientist, don't be afraid to ask questions and wade into the debate. It is possible for everyday people to understand, and be part of, the conversation of science. Trust but verify the advice of experts. Relying on the knowledge of people studying a specific scientific issue is a vital starting point. You can't just throw away everything science has learned and start on your own. But also don't be afraid to question the experts. They aren't infallible, and haven't always looked at things from every angle. This does not question their authority or integrity, it is the standard due diligence allowed, and required, from every good scientist. Be prepared to be wrong. In this case there was no evidence that her approach was harmful to her child. But in reading the article there is every sense she was willing to make a change if the evidence was compelling. That intellectual honesty is crucial for scientists and citizen scientists alike. In other words, perform your research with a humble confidence. Don't worry that you don't have a degree in child development or have not spent years in medical school. You can still investigate questions for yourself and help us all out. Just make sure to put it on the web so others can take advantage too! Last month it finally happened...we welcomed Baby OpenScientist to the world! He is a seven pound - fourteen ounce wonder of nature. He brings up great joy and contentment. He's also a great opportunity for new science. From the moment of birth our baby was weighed, tested, and measured so doctor's can track his health. In the age of electronic records it's the perfect opportunity to collect data on a person's life from the very beginning. Data that can not only be useful in the future to potentially diagnose disease, but also to support research studies on the causes and courses of disease. In our family we are adding to this data with the BabyConnect program available for both Apple and Android devices. This app let's you collect information on every diaper change, every nap, and every height/weight check your baby goes through. It also can track medications, vaccinations, developmental milestones, and playtime activities. These can be logged, charted, summarized, or downloaded for manipulation on your own computer. All of his is key information for tracking your baby's health. And it is key information that could be used in future research studies that need detailed health data from your newborn. I will have more on these uses in future posts, but for now it's good to start early and get the data collected. 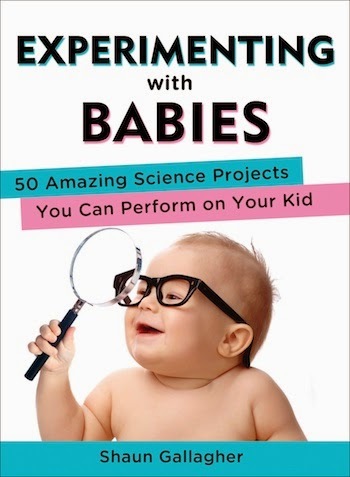 All of this now leads me to the book "Experimenting with Babies: 50 Amazing Science Projects You Can Perform on Your Kid." Taken from articles previously appearing on Psychology Today blogs and recent peer-reviewed research studies, the book walks parents through experiments they can perform with their children demonstrating interesting aspects of their development. For example, experiments that help show your baby really does like looking at mom's face, or that they understand what objects are theirs (versus those that aren't). So it's a highly educational book to understanding your baby's growth. In addition, reading this book teaches great new ways to play with your kid. For example, the section on infant reflexes is an interesting look at the motions babies perform without ever being taught, and demonstrate the power of genetics to inform early behavior. But triggering those reflexes while lying on the floor is also a great way to play with your child. It's scientific, you learn about your baby, and it's a bonding opportunity. How can you pass this up? Although it would take a while to perform all the experiments the book is a bit short. However, you can also visit the author's Experimenting With Babies web page for updates as new research offers opportunities for new experiments. So start with the book and playing with your child now, and keep adding new games as they get older. You'll be happy you did.